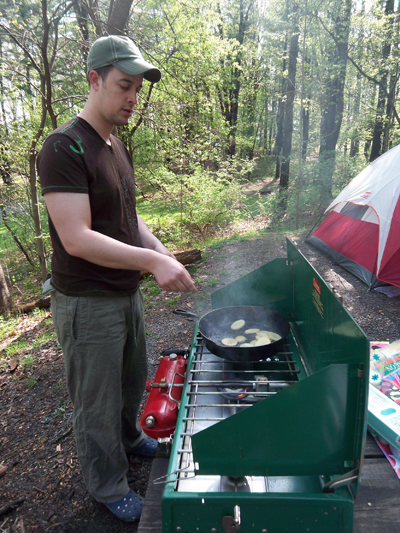 We did some experimental camp cooking this weekend. 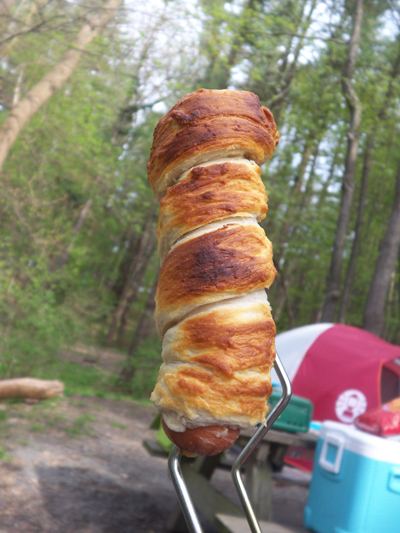 First we wrapped hot dogs in refridgerated bisquit dough. 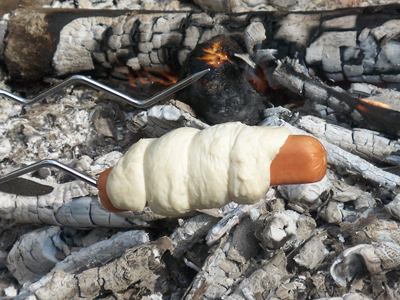 When you grill the hot dog over hot coals, the bisquit bakes. Big pig in a blanket. Dip in ketchup. Dip in mustard. Yummers. We also made special toasted marshmallows. 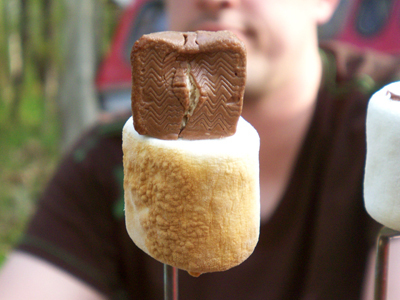 You know how sometimes when you pull a toasted marshmallow off a stick all you get is the toasted "sleeve". That can work to your advantage. 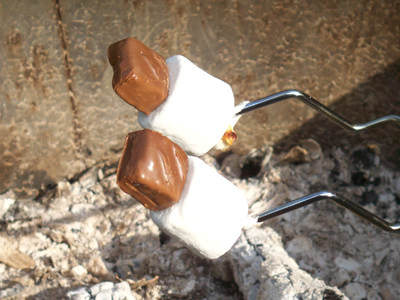 While toasting the marshmallows, add mini candy bars to the end of the stick. When you pull the marshmallow "sleeve" off, grab the candy bar inside of it. Ho, ho, ho. Toasted marshmallow candy bars sleeves. Tasty! Aaron also got to try out his new camp stove my parents found at a sale for us. Look at him tossing those sliced potatoes in the pan! Great idea with the candy bar! maybe you need to smoosh all of that up into a s'more! Have you ever done baked bananas or apples in the campfire?? Bananas are the easiest- just cut them open lengthwise, leaving the skin on, stuff with chocolate and marshmallows, wrap in foil and throw in the hot coals until hot and yummy! How clever! Almost makes me want to go camping! It looks like you had a lot of fun on your trip! Love the pictures of a pooped Oscar, so cute. MMM. Everything looks great! Last time we went camping, my son set a marshmallow on fire, and proceeded to shake the long fork till it was sent flaming across the picnic table onto the windshield of my truck....i must camp again soon. Love the coleman puppy line, very cool, although i dont think my cats would enjoy camping very much..unless it was on the beach (big litter box you know)! the hot dog and biscuits is killer!!! Carrie - the baked bananas sound great! We will have to try that. At first I totally thought you were roasting hot dogs in a marshmallow crust. It's like campfire Iron Chef! oh, that looks yummy~ doggie looks cute too! 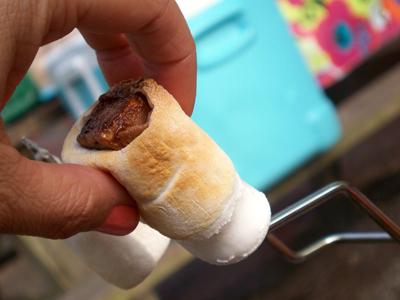 >.eek.< at putting ketchup on a hot dog thats sooo gross...buuuuttt i LOVE LOVE LOVE those mini candy bar smores--great idea! Sweet Christ. What is that in his feet? Don't even try to pretend those are cool. Toss those on the grill and regain a shred of dignity. Those both look fun n yummy. I love food experiments! Bwahahaha, you got an Anonymous Croc-hater comment! I think Crocs would be the perfect camping shoe. 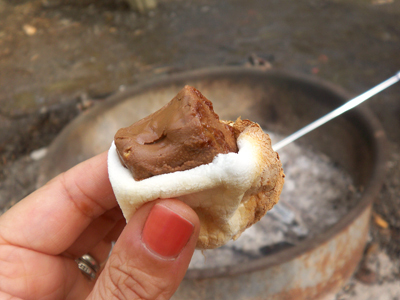 Oh my gosh I've got to try your marshmallow/candy bar trick next time I go camping.